This is part 3 of my 5-part travel series on Ubud where I share things to note as a traveler living in Ubud and how to make the best out of your trip here. The main form of transport in Ubud is the scooter. Almost all locals, guys and girls alike, know how to ride a scooter. Scooters in Ubud are like bicycles in Holland. There are four ways to get around Ubud which I’ll outline below. Because I can’t ride a bicycle 😑 much less a scooter, I couldn’t use this form of transport. If you’re staying in the countryside, it’s not possible to walk to Ubud Center due to the distance, not to mention scorching sun, winding pathways, and steep slopes. 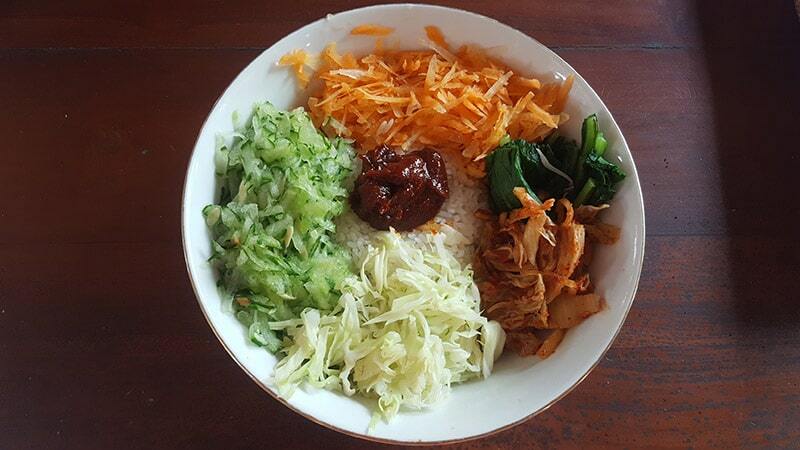 This was why I later chose to stay in Ubud Center in 2018 — it was the easiest way for me to access the vegan restaurants. There is no official standard. A taxi can be basically any car (or motorbike) — there is no standard “look” or symbol to help you identify a taxi. As long as someone is holding up a cardboard sign saying “TAXI,” that person is supposedly a taxi driver. “Bluebird,” the most well-regarded taxi company in Bali, does not cruise here, so you will not find a Bluebird unless they happen to be sending someone in here. There are no metered fares. You need to bargain and agree on the fare before getting into the car. Since you’re a tourist, they’ll naturally quote you a high price. Some of the drivers are pretty thug-like. According to the Wiki Travel page for Ubud, there is a Taxi Cooperative (mafia) operating in Ubud that ensures that the supply of transport is restricted and prices are kept high. You need to look for the taxi drivers. They are usually sitting along the streets of Ubud Center, calling “Taxi! Taxi?” to foreigners walking by. If you’re trying to get a cab while in the countryside, tough luck — you likely need to arrange for transport with your host or ask some random person to drive you for a fee. Because of the untransparent rates, I wasn’t keen on using the taxi. I also dislike the haggling process where the drivers would quote some exorbitant price that I know is ridiculous because I know the local rates. You would need to repeat this whole bargaining/haggling process with every new driver you meet, and typically you would need to walk off and display displeasure for them to relent and lower their rates (which would still be high). Basically, their goal is to get as much money as they can out of you, rather than offering a fair price based on the service or trying to help a fellow person out. I got sick of this after a few times. This really tainted my view of Ubud as I feel the local taxi culture (the taxi mafia, how it tries to control the rates by blocking competition, its profiteering mindset) is incongruent with what Ubud should be about. When I was staying in the countryside, I would make weekly grocery trips to Ubud Center where I would need a car. For that, I arranged private transport with my host. I always booked a two-way trip which would cost 100k rupiah or USD 7.10. To make the most out of the trip, I combined my grocery shopping with my lunch purchase. The driver (his cousin) would wait for me outside the supermart/restaurant while I run my errands (which could take 1-1.5 hours in total). As of 2018, Uber is banned in Ubud and Grab is banned by association too. It’s unclear whether Go-Jek’s transport service is banned too (more on Go-Jek in section 4 below). The local drivers were protesting against these transport services as they were eating into their income. This is slightly different from a taxi motorbike ride in that here you are approaching a random person to get a ride and offering a fee. This method is more applicable in the countryside as it’s hard to find a driver whenever you need one, and the people in the countryside are generally quite okay and honest. If you are living in the countryside and need to use this option, I recommend approaching official workers like restaurant staff so at least you know who you’re speaking to. A one-way trip that’s 10 minutes / 6km long should cost 30k rupiah (USD 2.2) or less depending on your bargaining skills. A two-way trip (where you just buy takeaway and leave) should cost 40k rupiah (USD 4.4) or less. But in general, you won’t have leverage if you’re trying to get transport in a village, simply because there are no alternative options. It’s best to rent a scooter if you’re staying for more than a few days. 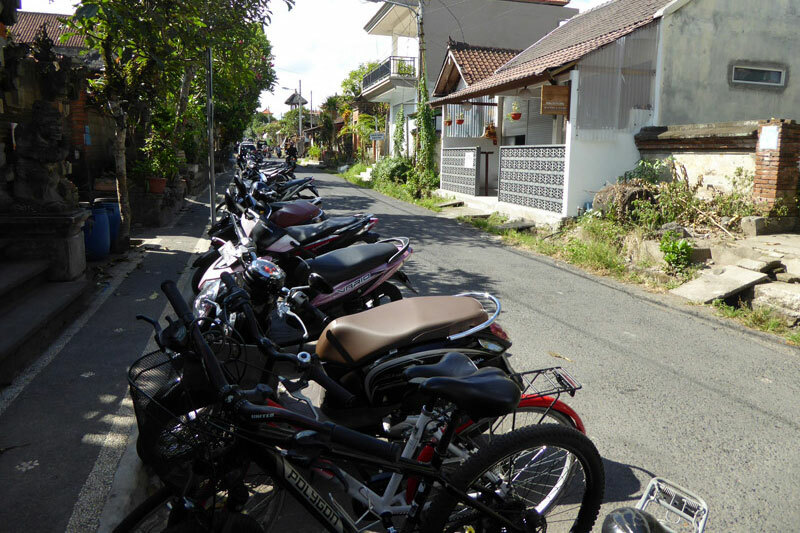 If you don’t know how to ride a scooter and you’re here for a long stay, it may be the best to simply stay in Ubud Center. Go-Jek is an awesome service in Indonesia. I found it by accident when googling for alternative transport in Ubud. 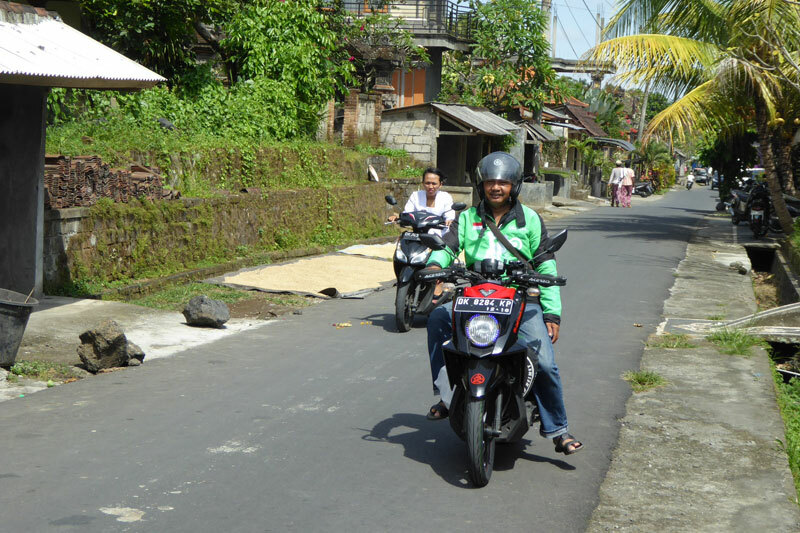 If you’re staying in Bali for a long stay, you must try Go-Jek! GO-CAR — private car transport service. It’s like booking a taxi. GO-TIX — get your concert tickets delivered! Very extensive huh? I guess that’s why their tagline is “An Ojek For Every Need”! The best part about Go-Jek is that their pricing is calculated by distance so there’s no need to bargain. 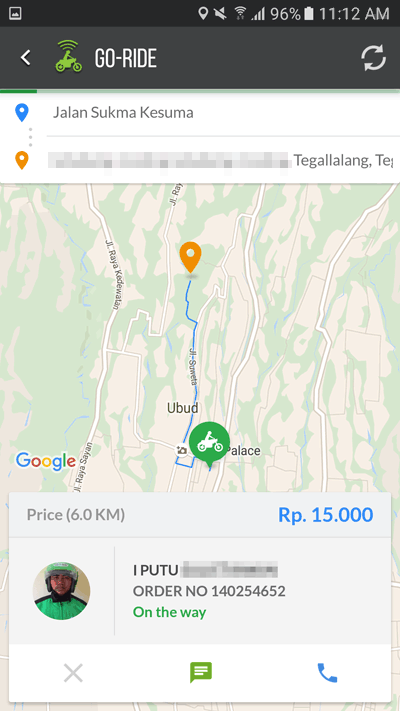 Because Go-Jek is targeted at locals, Go-Jek fees are very reasonable and cheaper than any fees you’ll ever get via private motorbike/car hire. When I used GO-RIDE (their motorbike taxi service) in 2016, it cost me 15k rupiah (USD 1.1) per trip, while GO-FOOD cost me 19k rupiah (USD 1.5) per booking. For both bookings, the distance was from Ubud Center to the countryside (6 km). No haggling, no negotiation. You can either pay by cash or GO-PAY (which is their cashless payment system but I don’t think it’s applicable to foreigners). I pay by cash all the time. 2018 Update: Unfortunately it seems that Go-Jek’s GO-RIDE (motorbike transport service) is unofficially banned in Ubud due to the local taxi mafia. While walking around Ubud Center, I saw a banner that said “Uber / Grab / Go-Jek banned here,” and I have read stories of Go-Jek drivers being harassed by the local taxi mafia. 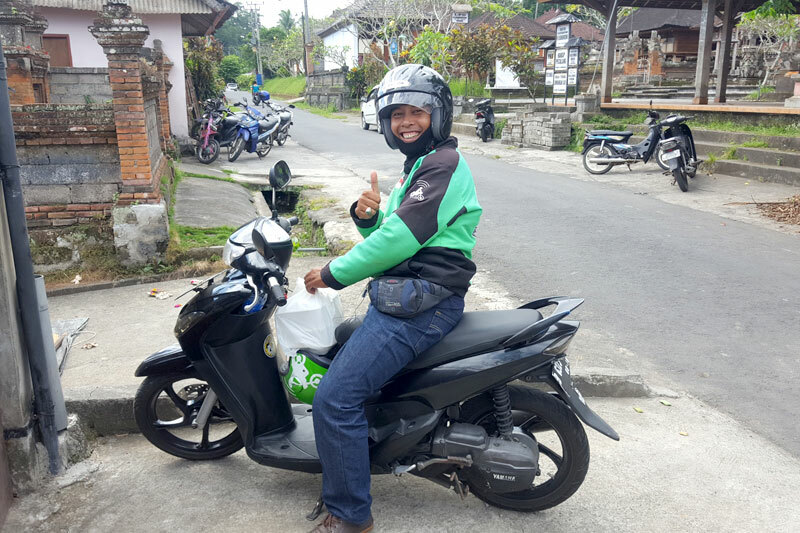 Go-Jek’s other services such as GO-FOOD (food-delivery) still operate fine in Ubud, and Go-Jek’s entire service still operates throughout Indonesia and Bali (other than Ubud). You can still try Go-Jek’s GO-RIDE (transport) and see if any drivers pick up your request. Like any transport service, you are limited by the number of motorists in your area. I found it very hard to get a driver for GO-RIDE (transport) when I was staying in the countryside. My guess is that it’s too far out for them to bother. I had no problems getting GO-FOOD (food delivery) from Ubud Center to the same place though. You need an Indonesian number to use it. This means you need to get a local SIM card — a prepaid one will work and it costs 100k rupiah or below. You should buy this when you reach Ubud rather than the airport as it’s much cheaper in Ubud. After keying in your local number, you will be asked to verify the number, after which you are good to go. This also means that it won’t be worthwhile to use Go-Jek if you’re just in Bali for a short trip. Update Dec 2018: According to reader Jon S., he was able to join Go-Jek using his Australian number and simply replaced +61 (Indonesia country code) with +62 (Australia country code). He could subsequently place GO-FOOD orders this way. I wasn’t able to register with a foreign number when I tried this years ago (the app didn’t allow me to change the country code), so it seems like they have changed their app to include all countries now. Give it a shot and let me know if it works! As Go-Jek is very much a local service, most drivers don’t speak good English. Some may not even know English. But as the services are quite straightforward (food delivery, bike ride), it is largely okay unless there are hiccups. I’ll share how to use Go-Jek below. Install the app. 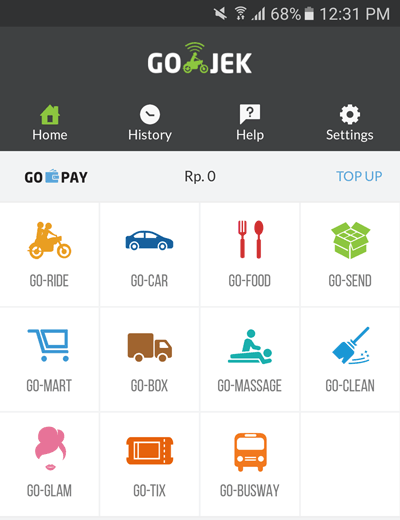 Go-Jek is in the Google Play store and Apple App Store. Search for “gojek.” It’s the #1 result and the logo has a black background with a green motorist. Register your account. It will ask for some simple details. You will need a local phone number such as a local prepaid sim card number. Note that the “0” in front of local phone numbers should be removed when you add the country code (+62). It will instantly send you a verification code via SMS. After you verify your number, you’re done! The whole process is amazingly fast. Took me two minutes! I wasn’t expecting such efficiency to be honest! This is where you select your service. GO-RIDE and GO-FOOD are the services I have used and they are probably the most commonly used services. Here, I’ll demonstrate how to use GO-RIDE, followed by GO-FOOD. Enable Location. Once you click into GO-RIDE (or any of the Go-Jek services for that matter), it’ll prompt you to enable GPS/Location. Click “Yes.” You need to do it so that Go-Jek can locate where you are. Select Pickup/Destination. You’ll get a menu to select (a) Pickup (where the driver should get you), and (b) Destination (where you want to go). Key in the respective addresses. You can do micro-adjustments on the map to fine tune the pickup/destination spot. First, you select your pickup and destination (left screenshot). Then, you will see the route and the price for the booking (right screenshot). Order and Wait. After you check that everything is right and you are okay with the price, click “ORDER.” Go-Jek will then dispatch your order to its drivers nearby. There’s nothing to do now but wait. Wait for the driver to arrive. Once Go-Jek gets you a driver, it’ll show on the app. You’ll then get details on where the driver is currently, how far away he is from your current spot, how many minutes he’ll take to arrive, plus a picture of his face! You can even call or message him directly if you want. Cool, huh?? In my experience, the driver will call me right away to verify that I’ve made the booking, and upon confirming, starts driving over. Reach your destination and pay! Hop on his bike, enjoy the breezy ride through Ubud/Bali, and then pay him at the end of the trip! The fee will be the amount stated in the order. Leave a review (optional). After that, you’ll be prompted in Go-Jek app to review the driver. I always leave a 5-star review and some positive words — I assume the drivers see it and it’ll encourage them in their work! Like I mentioned above, I had difficulty getting drivers for GO-RIDE when I was staying in Tegallalang (the countryside). I tried on five separate days at different times, waited for over 15-20 minutes each time, and was unable to get any driver. The one time I managed to get a driver, he called me after I had waited for 30 minutes to tell me that his motorbike broke down and for me to cancel the order. Plus he couldn’t really speak English so I could only understand what he meant after much struggle. But this was a one-off encounter though. 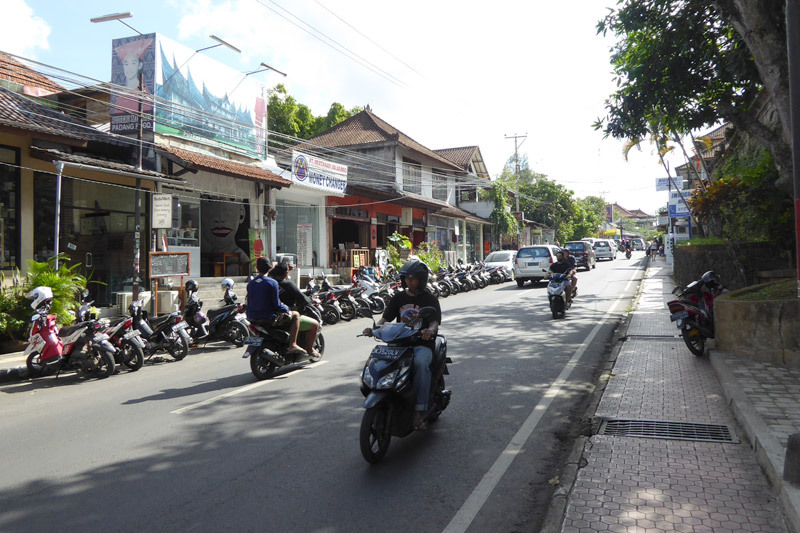 On the other hand, I had no problems when booking GO-RIDE in Ubud Center or near Ubud Center. I always had a driver accept my order within a minute. GO-FOOD is my favorite part of Go-Jek. I used it 10 times during my stay here! It works just like Deliveroo, Food Panda, and Grab Food. Here, I typed “veg” just to see what comes up in the search results. Note that it’s only a search by the restaurant’s name, not the cuisine. So if it’s a vegetarian restaurant but it doesn’t have “veg” in its name, it will not appear. Their listing is quite extensive. They have all the veg restaurants that I visited before. I also tried searching restaurants that I haven’t visited yet and GO-FOOD has them too. Great way to try different food without visiting the place! After selecting the restaurant, you select your order. Most restaurants will have their menu, or at least part of their menu, in the GO-FOOD system. If so, ordering is a matter of simply clicking through the menu, selecting what you want, and confirming your order. However, some restaurants do not have their menus keyed in. If you are a regular customer there, you can input your order manually (the item name and the price of that item) in GO-FOOD, then confirm your order. I have used both methods before with no problem. I usually order 2-3 meals at one go to save the hassle of ordering the next day. I just store the food in the fridge and heat it up later. The GO-FOOD delivery fee for this order is 19k rupiah (USD 1.5), calculated based on the distance between the restaurant and my address. It’s 3-4k rupiah more expensive than GO-RIDE for the same distance since the driver needs to drive to the restaurant, order for you, and wait for the food to be ready. After you press “ORDER,” Go-Jek app will dispatch your order to its pool of drivers. Once Go-Jek gets you a driver, it’ll let you know right away. It’s the same as GO-RIDE. I never had to wait more than a few seconds for someone to take up my booking. It’s that fast. Maybe because I was always ordering from restaurants in Ubud Center which is the main town area. Like with GO-RIDE, the driver will call you right away to confirm your booking before heading to the restaurant. He’ll pay from his own pocket first and you’ll pay him later when the food is delivered. By the way, do check that the restaurant address is correct when placing your order. You can verify via the restaurant website/Facebook (if it has one). 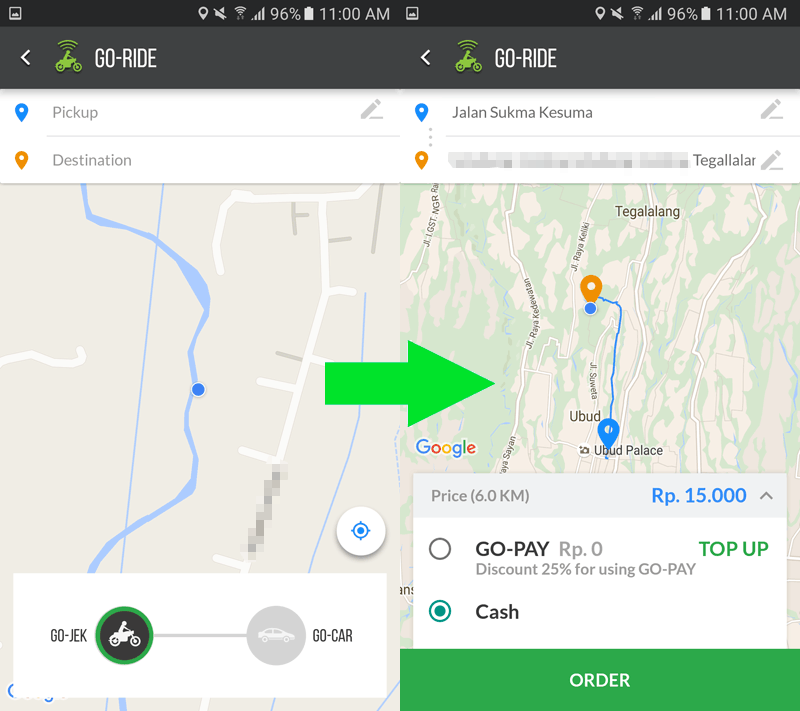 Some restaurants may have shifted and have not updated their address in Go-Jek. 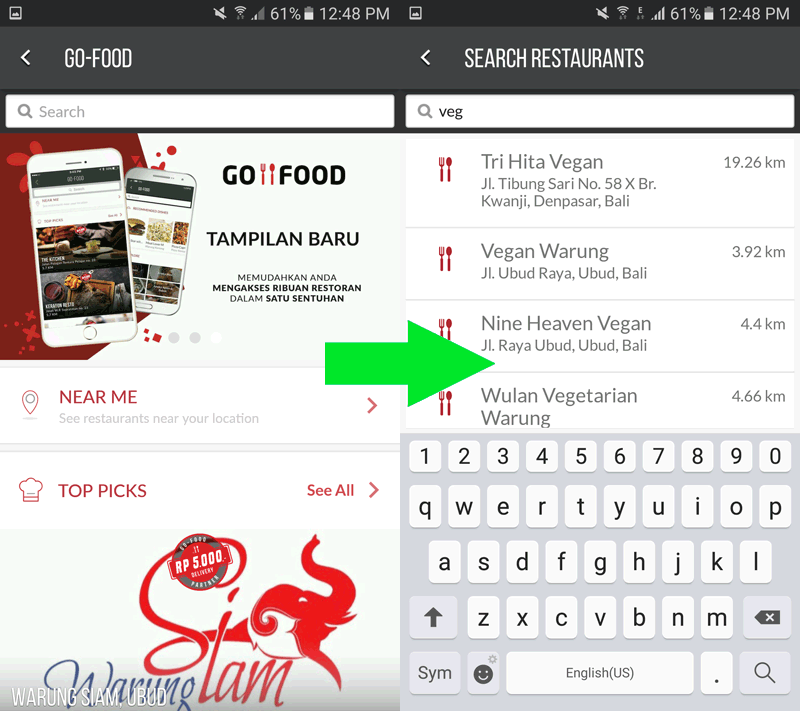 For example, Nine Heaven Vegan happens to have an outdated address in Go-Jek, so I always have to relay the new address to the Go-Jek driver when he calls me just so he doesn’t go on a wild goose chase. The exact location of the driver by GPS. What he is doing right now (driving to the restaurant? waiting at the restaurant? completed order and driving to your place?). The driver’s picture and his number if you want to call/text him to check on the status. This is driver Eko. He’s awesome and it’s my second time having him as my GO-FOOD driver! Step 5: Get your food and pay! Because there are no house numbers where I live, I head out to wait for my driver when I see he’s reaching my place so that he doesn’t get lost. Some drivers will text you to let you know that they are on their way while some won’t; I personally just check the app regularly to know where the driver is. Once you meet them, they will pass you the food order, the receipt, and you will pay them the cash. Tipping is not necessary but I usually give a 5-10k rupiah tip (USD 0.4-0.7). I think they deserve it considering each food order takes about an hour and they are running around in the hot sun! I find that Go-Jek drivers are humble folks trying to make a living, whereas the freelance taxi drivers often hanging around Ubud Center are more thug-like and very profit-focused in mindset. Eko with my GO-FOOD order. He’s a great guy! Piping hot lunch ready to be eaten! Look at the large amount of vegetables!